Manuele is a product designer who believes that great attention to UX and a design thinking approach are the souls of successful projects. Design tools are constantly improving, and more are entering the market every day (InVision Studio, for example). That being said, modern design tools such as Sketch are created to be minimalistic, where the tool is set out to eliminate all non-essential features. It’s typical to create additional functionality only when needed—and this is where we enter the interesting world of Sketch plugin development. More often than not, Sketch designers have at least three or four Sketch plugins installed. The plugins below are somewhat basic in nature but are commonly used because they’re huge time savers. If you’re curious to see what can be accomplished with Sketch plugins, take a look at our ultimate list of 50 Sketch plugins. 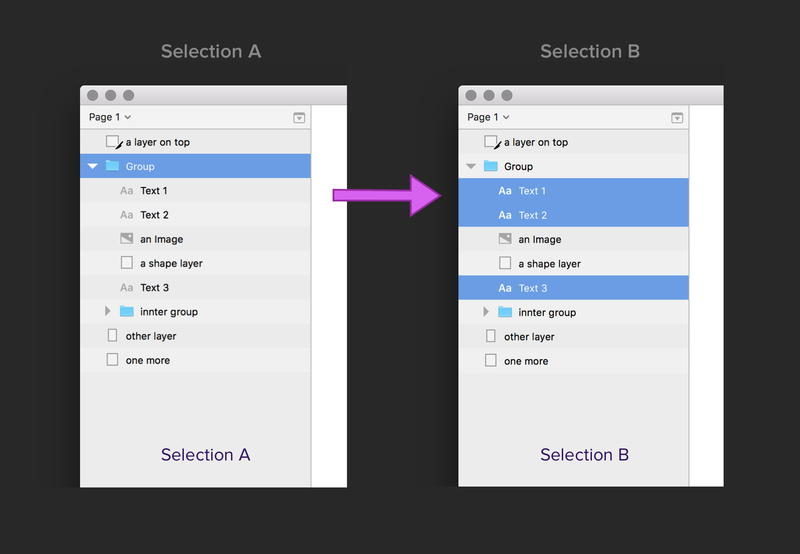 The RenameIt plugin is a popular Sketch plugin that helps designers rename multiple layers at once. Code comments are like hidden notes—they’re not user-facing and thus won’t show up in the resulting Sketch plugin. Developers typically use these code comments to explain the code that’s been written, so if another developer reads the code, or if they return to the code later, they’ll understand what’s been written and how it works. The scripting window. Highlighted: the console, which is used for testing the output. Notice that the age value isn’t wrapped in quotes. This is because quotes will define the variable as a string, meaning the intended output is to be literal. We don’t want that; we want the variable to be defined as an integer/number so that we can perform math on it. Putting quotes around the value will undesirably define the value as a string. Functions are actionable—they do something. In the example below, the function calculates the sum of a and b. In this example, a is 2 and b is 3. Conditional statements only run the code inside their brackets if the specified condition is met. In the example below, the code runs right away because the value of firstName does in fact equal “Manuele”; therefore, the else if and else code does not run. 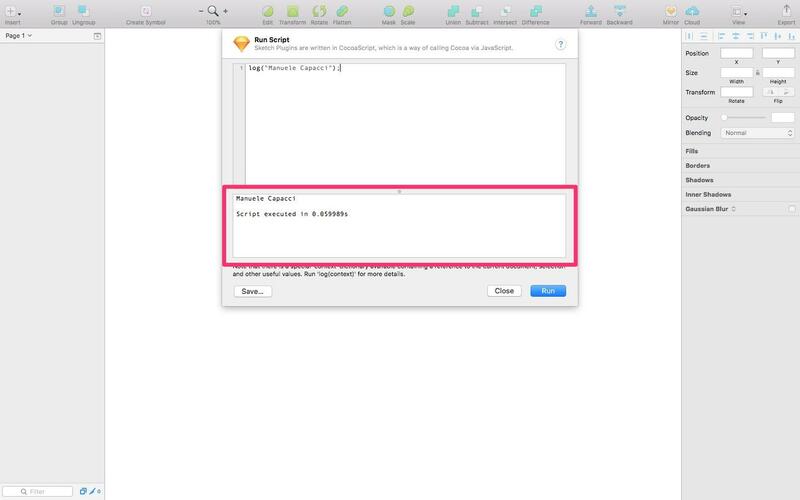 Let’s try writing some basic code in Sketch. Navigate to “Plugins → Run Script” in Sketch. In this scripting window, you can write code to make things happen in Sketch (such as rename layers), and later on package this code into a Sketch plugin with the .sketchplugin filetype. What you’re doing here, is calling the log function and passing the string Hello Sketch as an argument. This log is only accessible behind the scenes, making it useful for debugging code when things aren’t working as expected. 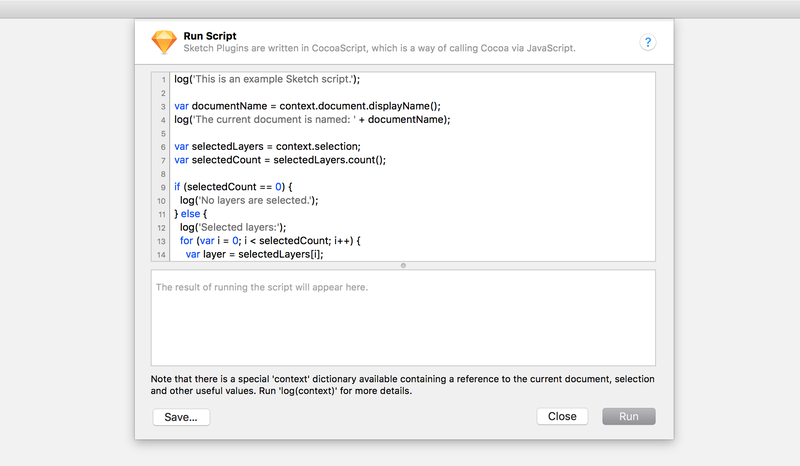 If you click the “Run” button, the argument Hello Sketch will be logged in the console underneath the scripting window. The code must start with a boilerplate line. You need to use Sketch’s Application Programming Interface (API)—this is a fancy term for a special object that you’ll need if you want to interact with Sketch in any meaningful way. Name this special API object sketch. All of the information about the currently selected layers is contained inside the selection variable. Now you just need to “iterate” (repeatedly run some code) over the layers to rename them. A popup will appear asking the user to specify a new name for the layers. If you’re not sure how to access certain contexts such as currently selected layers, or how to reveal a user-input box (like in the scenarios above), you can read the official Sketch developer documentation, which will show you what code is required. When you’re ready to move on, hit the “Save…” button in the bottom-left corner of the scripting window and give the script a name. You’ll now find this Sketch plugin accessible from the Sketch menu under “Plugins,” same as with all other Sketch plugins. Now let’s create something a little more complex. This next Sketch plugin will auto-select all layers within a group, which you can then adapt to include only text layers, or only shape layers, or it could even auto-detect the layer type and only select layers of that type. As previously, let’s start by defining the context. Then you can iterate/repeat over the layers within that context and auto-select them. With this code, all layers within any currently selected groups (providing that some are selected) will be selected. Meanwhile, the groups themselves will be deselected. If you’re curious about developing Sketch plugins that other designers can use, take a look at SKPM (Sketch Plugin Manager). SKPM allows designers to package their plugins into the .sketchplugin file format, which makes the plugin installable. During this process, plugin developers are also able to define keyboard shortcuts for the plugin’s actions. What is the use of an if statement? An "if" statement is a conditional statement that checks if a condition is met before executing the code that follows. If the condition is not met, then the code is not executed. Manuele is a product design consultant who believes that great attention to user experience and a design thinking approach are the souls of successful projects. He helps entrepreneurs, product owners, and developers all while delighting users, discovering what they want and need, and matching their needs with business objectives.